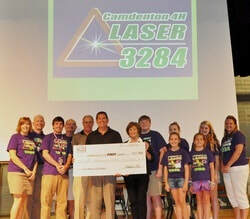 ​In November, the Camdenton FIRST® LASER Team 3284 was thrilled to host an official FIRST® Qualifier at Camdenton High School. Twenty four teams gathered for a day filled with Coopertition® and Gracious Professionalism®. With 132 community volunteers and judges, the LASER teams introduced the “Hardest Fun Ever” to several central Missouri rookie teams and over 1,000 spectators. 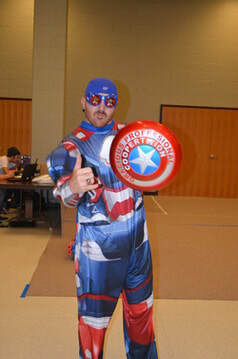 The "Iron Patriot" served as the emcee for the event. The superintendent of the Camdenton School District, Dr. Tim Hadfield, opened the event and introduced two of our region's legislators, Diane Franklin and Rocky Miller, at the awards ceremony. A special video from the Commissioner of Education was shared, welcoming FIRST® to central Missouri. LASER competed at the FIRST® World Championship Galileo Finalist! LASER was a part of the #2 alliance on Galileo. The alliance consisted of 2169, KingTec, team 2175, The Fighting Calculators, and LASER. After several hard fought and contested battles, LASER 3284 and the alliance ended up as finalists in the World Championship! Congratulations to Dean’s List Finalist Kyle Gulshen. Camdenton LASER 3284 is proud to have a team member become a part of this elite group of individuals that represent the best in FIRST®! LASER 3284 teamed with Missouri Assosication for Adult Continuing and Community Education (MAACCE) to support the "Run for Daniel K" event, raising funds and awareness for Prader-Willi syndrome research. The LASER 3284 World Championship finalist robot, "The Patriot", kicked off the 5K run, held at Tan-Tar-A resort. The Missouri Commissioner of Education, Dr. Chris Nicastro, introduced LASER 3284's NAO Robot, teaching more about FIRST® robotics and Afterschool programs. ​Sakelaris Ford of Camdenton presented Camdenton FIRST® LASER representatives with a check for $12,000 to support FIRST® robotics. The funds were raised through Sakelaris Ford's "Drive 4 UR School" fundraiser. Sakelaris Ford generously sponsors this event annually and has helped to raise over $30,000 for the LASER team. The purpose of Show-Me robotics is to promote FIRST® and the core values of Gracious Professionalism® and Coopertition® through an off-season FRC® event. LASER 3284 also showcased FIRST® through FLL® and FTC® demonstrations, as well as Sea Perch robotics from a LASER 3284 summer camp. Displays were viewed by thousands of state fair visitors. The Camdenton FIRST® LASER 3284 FRC® team competed at the 2nd annual Ozark Mountain Brawl held in Springdale, Arkansas on September 13th and 14th. This event had teams that traveled from five different states and was a reenactment from the previous year's FRC® game, "Ultimate Ascent". A small contingency representing the year's team was selected to participate to gain knowledge about competition logistics and valuable experience during the off season event. The team and the World Championship finalist robot "The Patriot" earned the Finalist Trophy, just falling short in the finals best of three matches.